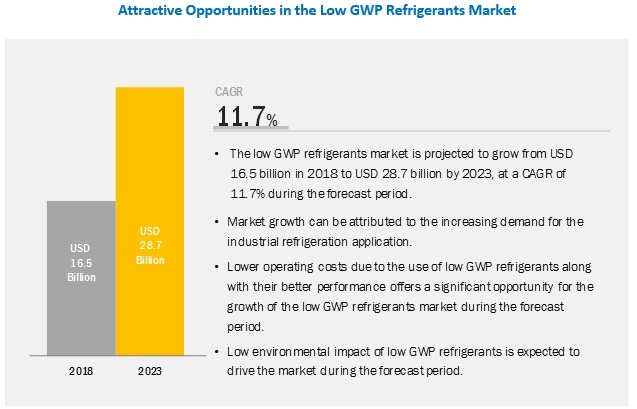 [158 Pages Report] The low GWP refrigerants market is projected to grow from USD 16.5 billion in 2018 to USD 28.7 billion by 2023, at a CAGR of 11.7%. The major factors driving the low GWP refrigerants market are the low environmental impact of low GWP refrigerants, phasing out of CFC, HCFC, and HFC refrigerants, and the increasing demand for refrigerants and air conditioners across the globe. Hydrocarbon refrigerants have excellent thermodynamic properties, and refrigerating and air-conditioning systems operating using these substances are highly energy-efficient. Hydrocarbon refrigerants are miscible with conventional refrigerating oils and have a relatively high critical temperature. Hydrocarbon refrigerants are flammable in nature and can be explosive as well; this is a major safety concern associated with the use of hydrocarbon refrigerants and therefore requires hermetically sealed systems with explosion protection for electric components. The Montreal Protocol and Kyoto Protocol have led to reductions in the use of environmentally harmful refrigerants, especially in commercial refrigeration plants. Plug-in equipment, such as vending machines used in small stores and supermarkets that rely on hydrocarbons and CO2 have been available for a few years. In large supermarkets, refrigeration (centralized systems) CO2 cascade systems are an alternative to common HFC systems in cold and moderate climates. Hydrocarbons have also proven to be highly efficient alternatives in most applications under high ambient temperatures, except for larger condensing units. The low GWP refrigerants market in Europe is projected to witness high growth during the forecast period on account of the recent F-gas regulations/HFC phase out plan which dictates the reduction of use of HFC refrigerants by almost half by 2025. The region also enjoys the highest number of end users who have already switched to refrigeration systems based on low GWP refrigerants. Key players in the market include Linde Group (Germany), Honeywell (US), Sinochem Group (China), Airgas Inc. (US), Engas Australasia (Australia), A-Gas (UK), Puyang Zhongwei Fine Chemical (China), Harp International (UK), Tazzetti (Italy), Shandong Yueon Chemical Industry (China), HyChill Australia (Australia), GTS (Italy), Chemours (US), Mexichem (Mexico), Daikin (Japan), and Arkema (France). These players have expanded their geographical presence through new product launches & developments, partnerships & contracts, expansions, and acquisitions & mergers. The Linde Group, the market leader in the low GWP refrigerants market, invested USD 33.70 million to expand production capacity and meet growing customer demands in Malaysia. This is expected to enable Linde to meet the forecast growth in demand in the Malaysian region. Such acts of expansion can be followed by other players to strengthen their positions in the low GWP refrigerants market. In June 2018, A-Gas launched a new total solutions packet which includes fire extinguishing agents and expert consulting services in the Australian market. The impact of launching agile services is expected to strengthen the company’s position in the Australian market. In November 2018, The Linde Group, along with NLMK Group, signed an agreement for the long-term supply of industrial gases to the Novolipetsk Steel site in Russia. This contract is expected to embark upon a strategic partnership between Linde and NLMK and is an opportunity for Linde to expand business in Russia. How will all these developments affect the industry in the mid to long term? What are the upcoming industry applications for low GWP refrigerants? What is the impact of the change in the environmental policy globally on the low GWP refrigerants market? When will emerging countries adopt the CO2 refrigeration technology? What is the phase-out status of HCFC and HFC refrigerants? The study involved 4 major activities to estimate the current market size of low GWP refrigerants. Exhaustive secondary research was done to collect information on the market, peer market, and parent market. The next step was to validate these findings, assumptions, and sizing with industry experts across the value chain through primary research. Both, top-down and bottom-up approaches were employed to estimate the complete market size. Thereafter, market breakdown and data triangulation procedures were used to estimate the market size of segments and subsegments. As a part of the secondary research process, various secondary sources, such as Hoovers, Bloomberg BusinessWeek, and Dun & Bradstreet were referred to identify and collect information for this study. The secondary sources included annual reports, press releases & investor presentations of companies, white papers, certified publications, and articles from recognized authors, authenticated directories, and databases. Secondary research was mainly conducted to obtain key information about the industry’s supply chain, market’s monetary chain, total pool of players, and market classification and segmentation according to industry trends to the bottom-most level, regional markets, and key developments from both, market- and technology-oriented perspectives. As a part of the primary research process, various primary sources from both, supply and demand sides were interviewed to obtain qualitative and quantitative information for this report. Primary sources from the supply side included industry experts, such as CEOs, vice presidents, marketing directors, technology and innovation directors, and related key executives from various key companies and organizations operating in the low GWP refrigerants market. Primary sources from the demand side included directors, marketing heads, and purchase managers from end-use industries. Following is the breakdown of primary respondents. After arriving at the overall size from the market size estimation process explained above, the total market was split into several segments and subsegments. To complete the overall market engineering process, and to arrive at the exact statistics for all segments and subsegments, data triangulation and market breakdown procedures were used, wherever applicable. The data was triangulated by studying various factors and trends from both, the demand and supply sides. In addition to this, the market was validated using both, top-down and bottom-up approaches. This research report categorizes the low GWP refrigerants market based on type, application, and region, forecasting volumes and revenues as well as analyzing trends in each of these submarkets.